The Examination Board's assessments support active learning in the classroom. 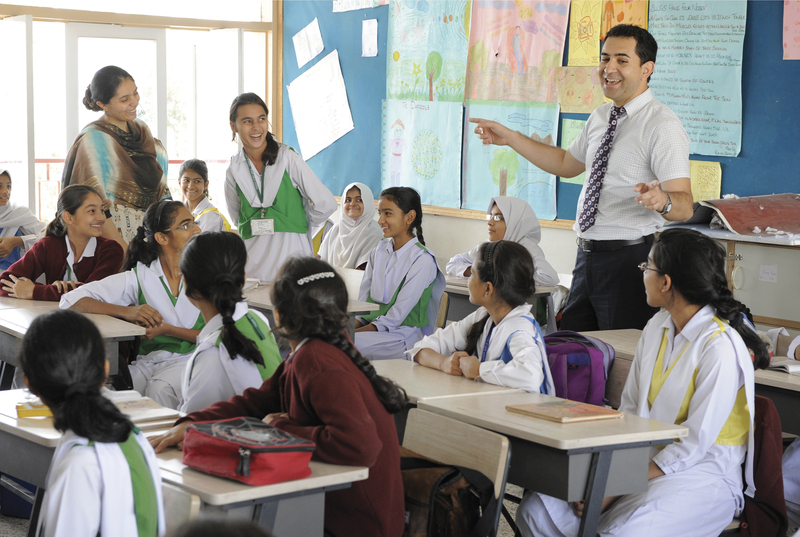 Since 2003, the Examination Board has played a unique and powerful role in improving teaching and learning at middle and secondary schools in Pakistan, through an innovative mix of standardized testing, teacher training and syllabi. Schools across Pakistan have adopted the AKU Examination Board’s testing and assessment systems, which experts, teachers, parents and students have applauded for their positive impact on learning. In 1995, 16 private schools in Pakistan wrote to Aga Khan University to express concern about the poor quality of secondary education in the country. Echoing a widespread complaint, they identified the country’s testing system as a major problem and asked the University to establish an independent examination board. In Pakistan, graduation from secondary school and admission to university is contingent upon passing a test whose content is determined by one of a number of regional examination boards. At the time, these boards were all government entities. The schools’ request launched a process that culminated in AKU establishing Pakistan’s first private Examination Board, in 2003. While existing examinations largely rewarded memorisation, thereby reinforcing the heavy reliance upon rote learning in Pakistan’s schools, the AKU Examination Board has taken a different approach, developing exams based on Pakistan’s national curriculum that reward critical thinking and problem solving. At the same time, the Board works closely with schools to provide training, learning materials and appropriate syllabi that help teachers to move away from rote instructional methods and develop students’ analytical skills. The result is graduates who are better prepared to succeed at university and in intellectually demanding occupations, and to make a positive contribution to society. The Board uses a highly reliable, secure and transparent electronic marking system – the first of its kind in South Asia. Not only does this prevent cheating, it allows the Board to provide meaningful feedback on performance to schools, student by student and question by question. Today, the Board is recognised as a role model, and has assisted government examination boards in upgrading the skills of their staff and their practices. In 2014, more than 8,600 secondary and higher secondary school students sat for examinations developed and graded by the AKU Examination Board. In 2012, a survey of higher secondary graduates found that 86 percent had been accepted to university, and a 2014 impact assessment found that universities view AKU-EB graduates as being especially well prepared for higher education. In addition to its secondary and higher secondary certificates, the Board launched a Middle School Programme in 2011, recognising the need to reach students at an earlier age, during a critical stage in their development that helps to lay the groundwork for future success. Already, more than 5,800 students are enrolled in the Programme. The Board aims to make its services accessible to as many schools as possible while maintaining the highest quality standards. Fees are affordable compared to other private alternatives and the Board has begun to offer scholarships to individual students.